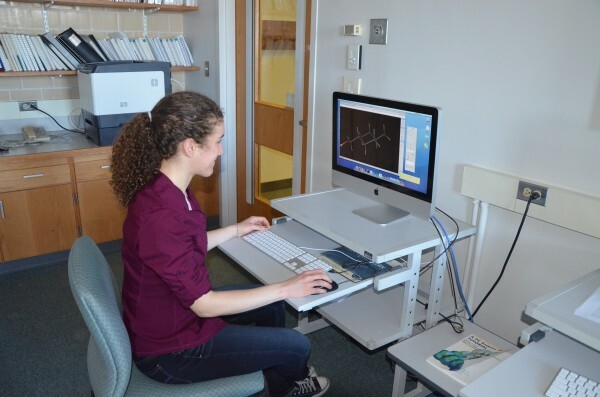 Maria Guerra, a student in the green chemistry class at Colby College, uses a computer model to evaluate the toxicity of MCHM, the chemical that spilled into West Virginia's Elk River in January 2013, cutting off residents' access to drinking water. Three weeks after thousands of gallons of a coal-cleaning chemical spilled into West Virginia’s Elk River, some residents have only recently been told that their water is safe to drink. Very little toxicity data existed for the spilled chemical, 4-methylcyclohexanemethanol, or MCHM, so regulators didn’t have a threshold concentration below which they could pronounce the water safe to drink. As residents and businesses flush their pipes, replace filters and tentatively begin to drink the tap water, questions swirl. Did lax safety standards, faulty equipment, or noncompliance with existing regulations create an environment ripe for this kind of spill? How is it possible that so little toxicity data existed for a chemical used in such a large-scale industrial process? While these questions are certainly important, they propagate the same old approach to risk mitigation of toxic substances that put us in this position in the first place. For years, industry ran on the mantra, “The solution to pollution is dilution.” As long as we dump our waste into big enough sinks — rivers, lakes or oceans — the toxic substances will be dilute enough to cause no harm, or so the thinking went. Today we have stricter regulation and limits for the release of certain chemicals into the environment. Storage tanks must be up to code, valves checked and more. Despite the number of regulations or inspections, accidents happen and safety equipment fails. Think of the recent derailment and explosion of railcars in Lac-Megantic, Quebec, and in North Dakota, or the explosions at a fertilizer plant in Texas. When safety equipment fails, we’re left asking questions. Is the chemical benign? Toxic at what concentration? Hazardous? Explosive? The astronomical number of new chemicals introduced to the market each year makes toxicity testing of each individual compound unrealistic, so in the case of the Elk River spill, these questions were left largely unanswered. Toxicity testing is important, but more so is rational design of inherently safer chemicals. If reduction of toxicity plays a role in the design stage of new chemicals, rupture of storage tanks will be less catastrophic. The patent for use of MCHM as a coal cleaning agent suggested that a previous chemical used to clean coal, 2-ethylhexanol, was suspected of causing birth defects, so this would provide an alternative. However, the inventors provided no rationale for why MCHM was any less toxic. Instead, it was billed simply as an alternative, which is hardly a logical way to move forward. A replacement with no design justification could be equally harmful. The green chemistry movement calls for such rational design of inherently nontoxic chemicals. Toward this goal, a team from Yale published a study in 2011 in which they correlate the known toxicity of hundreds of compounds to various properties of the individual molecules. Based on the toxicity correlation, the study proposed two guidelines to implement for the design of new chemicals. First, a compound should be much more soluble in water than in fat, so it has a harder time permeating the fatty membrane of individual cells. Second, it should have a relatively low propensity for taking electrons from other molecules — one of the ways a potential toxicant could wreak havoc inside a cell once it passes through the cell membrane. Using computer models to predict these two parameters, Maria Guerra, a student in the green chemistry class at Colby College, determined that MCHM’s propensity to take electrons from other molecules was below the threshold value proposed by the Yale team. However, the computer modeling predicted a fat solubility above the recommended threshold. Armed with this type of information, molecular designers could easily go back to the drawing board and tweak the compound’s structure, making a molecule that is likely to be less toxic. Of course, toxicity is only one of many environmental concerns. We must also consider how quickly compounds can move through the ecosystem and how long it will take for them to biodegrade. Despite the inventor’s suggestion that MCHM may be less toxic than some of the previous alternatives, it is unlikely that considerations of toxicity were incorporated in the design phase. As chemists, we receive little to no formal training in what makes a substance toxic. We design for performance and let the toxicologists and regulators worry about the environmental impacts. If instead, we chemists consider reduced toxicity as one of our design goals then regulators won’t need to worry as much about controlling exposure. When the inevitable failure of safety equipment occurs, wouldn’t it be better to know that the chemical inside was designed with specific considerations toward a reduction in toxicity? Reuben Hudson is a postdoctoral fellow in chemistry at Colby College in Waterville. Maria Guerra is a Colby student in Hudson’s green chemistry class.